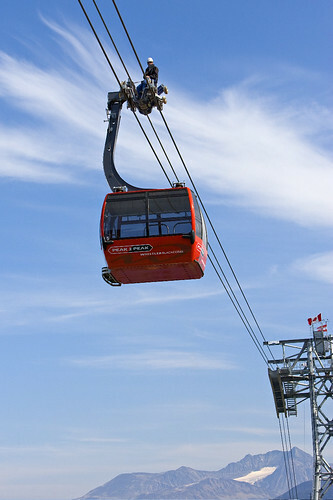 Twelve PEAK 2 PEAK Gondola Sky Cabins made the first journey across the 4.4km/2.73 mile span between Blackcomb and Whistler Mountains on September 19, 2008. Mathias Zudrell of Doppelmayr rode atop the first gondola to perform visual checks on its mechanisms as it traveled across the Fitzsimmons Valley. Whistler Blackcomb’s PEAK 2 PEAK Gondola will open to the public December 12, 2008. On the first day of autumn, Whistler Blackcomb mountain tops are covered with at least six centimetres of snow. With 65 days until the winter ski season and 79 days until the opening of the PEAK 2 PEAK Gondola on December 12, the upcoming ski season is looking good!